I like American whiskey. I like it for its bold flavor and the great variety of flavors. Also, ever since I got a little still as a birthday present, I'm a great fan of making my own liquor. The hobby is quite fun and allows you to go crazy and make eau de vie out of anything. Like dandelions. Which tastes amazing. So of course I'm a huge sucker for moonshine. 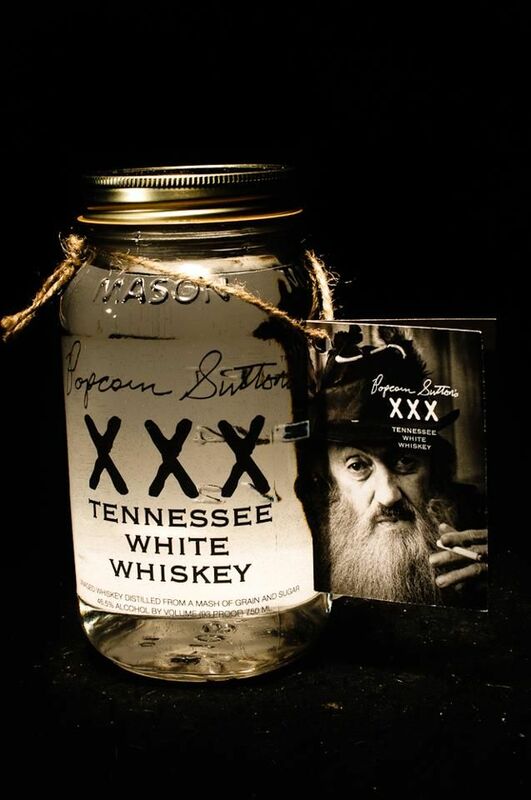 Which means I had to buy Popcorn Sutton's Tennessee White Whiskey when I stumbled over it, seeing as it came in this nice jar. First I had to taste this liquor straight and get an idea if it's best served neat or mixed with something else. It tastes a bit sweet, but still rough. You can definitely drink this neat or on the rocks, but I think it really shines when you use it in a cocktail. While thinking about the right ingredients for my cocktail featuring this moonshine, I immediately came to the conclusion that it should involve some fruity flavors. The sweetness of the liquor should harmonize well with citrus or other fruits. This is also a great way to get to know this spirit and combining citrus, spirits and sweetener can't really go wrong. Thinking about sweet and fruity whiskey made me remember my adventures with orange juice and Southern Comfort. Thus the idea of using fresh orange juice in my cocktail was born. Since orange juice has this natural sweetness I decided to add some lime to provide some much needed sourness. Some simple syrup brings everything together. You can use normal simple syrup if you like, but I used syrup made from Demerara sugar to keep this cocktail a bit more unrefined. Fill the whiskey, orange, lime and syrup into a cocktail shaker filled with ice and shake for 10 seconds. Strain and serve in an Old-Fashioned glass filled with ice. It's really tasty, very fruity and mild. The orange and lime flavors go well with the sweet taste of this corn based whiskey. A great combination to enjoy in spring and summer as it is quite a light and refreshing cocktail. But don't be fooled by the taste, with 44% ABV (88 proof) the whiskey definitely has a noticeable impact. It's essential to balance the amount of lime juice in this cocktail. If your limes are very sour, then use a bit less juice. While trying out recipes I used a bit too much lime juice and while it still was drinkable, it destroyed the harmony of moonshine and orange. While this wasn't the first corn based whiskey I tried, I have to say that Popcorn Sutton's lends itself really well to making cocktails. Underneath the rough edges it has a rather mellow flavor with natural sweetness. It tastes a bit like some strange eau de vie and while I'm probably not drinking much of this former moonshine neat, I'm looking forward to experimenting with it in mixed drinks. I hope you have the chance to try some moonshine based cocktails yourself, because I believe there is a vast potential in making cocktails with unusual ingredients. A lot of the fun of making cocktails is trying new ingredients and balancing them to create something new. If you like to find out what I can come up with next, follow me on Twitter or subscribe.